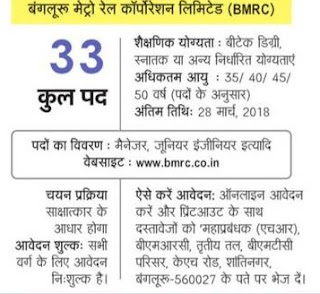 BMRCL Recruitment 2018 Apply Online For Vacancy in Bangalore Metro Rail Jobs For Fresher , Graduate Pass, For More News Reader should point out eyes below to check BMRCL Bangalore Metro Recruitment 2018. WBPDCL Recruitment 2018 There Is New Jobs Posted in Department of WB Power Development Corporation. Those who are Eager Having qualification in Management/Engineering Degree they are welcome in Kolkata based WBPDCL Engineers Fresher’s Recruitment 2018. WBPSC Finger Print Expert Recruitment 2018 Apply Online in 28 Posts of Finger Print Expert in C.I.D under the Home & Hill Affairs Department. Government of West Bengal; will posts of Junior Finger Print Expert in Criminal Investigation Department. For More details in Age Limit, Educational Qualification, Selection Process visit below. WBPSC MVI Recruitment 2018 Apply Online to the 234 Motor Vehicle Inspector (Technical) in West Bengale Public Service Commission Before 19 March 2018. Candidates who living in Westbengal or outside can also apply, for more details like Age Limit, Selection Process and Eligibility Criteria visit below. UP Passport Seva Kendra UP Govt will Open 15 Passport Seva Kendra in 15 Districts. 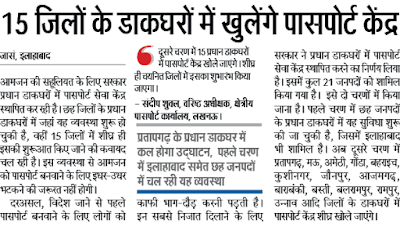 And Indian Ministry of External Ministry already announced the formation of several Post Office as Passport Seva Kendra’s ki alag branch in the Daak Ghar. 16 FAD Recruitment 2018 Apply Online for Latest Government jobs Opportunity in Field Ammunition Depot 15 DEO, Firemen. If you have heard 1st Time about 16 FAD Data Entry Operator Recruitment then read below to confirm about notification is correct or wrong.